This warm weather is a friendly reminder that beach body season is coming up and although we like to indulge, there are some junk foods that we should really steer clear of. Kimberly Snyder, celebrity nutritionist and author of The Beauty Detox Solution shares the top 5 worst fast/junk foods and gives her tips on great alternatives to stay guilt free and bikini ready! Fried Chicken- Made from conventional chicken laden with hormones and antibiotics, covered with gluten-containing breading and chemicals like MSG and salt, and fried in cheap, rancid oils, fried chicken is high in calories, fat, and other chemicals that can make you sick. Skip it altogether. Please, please just never eat fried chicken. 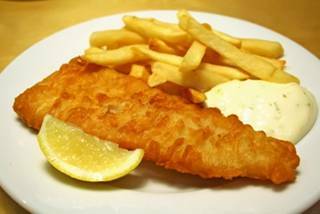 Fish and Chips - Many people select this as a “healthy” alternative in fast food, but it is anything but that. Fish serves as a sponge that mops up all of the toxic chemicals from the sea. Bread it in wheat flour (gluten) and fry it up, and you’re looking at an unhealthy meal. Avoid fish unless you know where it comes from, and opt for a salad instead. 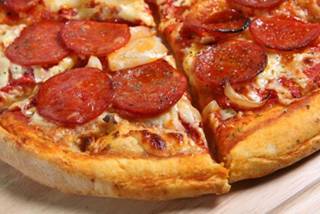 Pizza- Cheese and white flour combined with nitrosamine-containing salty processed meats, pizza is toxic and unhealthy. Why not try some brown rice or quinoa pasta with tomato sauce instead? 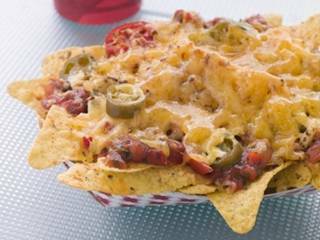 \Nachos- Corn chips loaded with cheese, meat and beans and then dipped in sour cream? Really?? Dairy, hamburger,salt, and GMOcorn are just a few of the health issues associated with this high fat, high calorie snack. 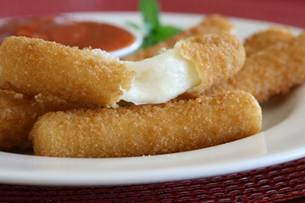 Instead, have some vegetable sticks dipped in salsa. Oh gosh, I hear you on the fried chicken. When Husband says he wants take-out chicken, I compromise and make oven-made crispy chicken. He likes it! Totally right, savory but unhealthy. I try to make my family tasty alternative recipies.